Emirates (Dubai) add Abuja, Nigeria on August 1. Abuja is Emirates 26th destination in Africa and its 144th worldwide. Emirates flight EK 785 landed at Abuja’s Nnamdi Azikiwe International Airport on August 1, marking the start of the airline’s daily service to its second destination in Nigeria. Services to Lagos were launched just over 10 years ago. 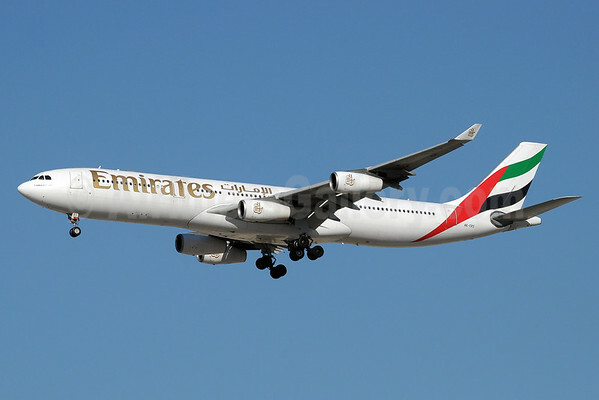 Emirates’ Dubai-Abuja route is served by an Airbus A340-300 which offers 267 seats in a three-class configuration – 12 First Class, 42 Business Class and 213 Economy Class seats. Customers on the route experience Emirates’ award-winning hospitality – from multi-national cabin crew and gourmet cuisine to the ice entertainment system, which offers hundreds of channels of audio and visual entertainment. Customers also enjoy Emirates’ generous baggage allowance of 30kg in Economy Class, 40kg in Business and 50kg in First. Emirates flight EK 785 departs Dubai daily at 1050 and arrives in Abuja at 1510. The return flight, EK 786 departs Abuja at 1935 and arrives in Dubai at 0550 the next morning. Copyright Photo: Paul Denton/AirlinersGallery.com. Airbus A340-313 A6-ERS (msn 139) arrives back at the Dubai hub. This entry was posted in Emirates Airline and tagged 139, A340, A340-300, A340-313, A6-ERS, Abuja, Abuja’s Nnamdi Azikiwe International Airport, Airbus, Airbus A340, Airbus A340-300, Dubai, DXB, Emirates, Emirates Airline, Nigeria on August 3, 2014 by Bruce Drum. 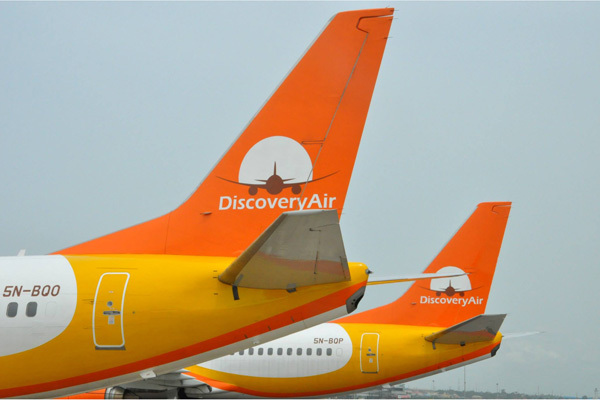 Discovery Air (Lagos) will start scheduled passenger operations on June 9 with three Boeing 737-300s. The company’s Air Operator Certificate (AOC) was issued on June 3. The first route will be between Lagos and Abuja in Nigeria. Services to Port Harcourt will also be operated. The company was incorporated on July 23, 2008 as a private limited liability company. The name comes from its primary owner, First Deepwater Discovery. Copyright photo: Antony J. Best/AirlinersGallery.com (all others by Discovery Air). Boeing 737-36N 5N-BQO (msn 28571) departs from Southend. 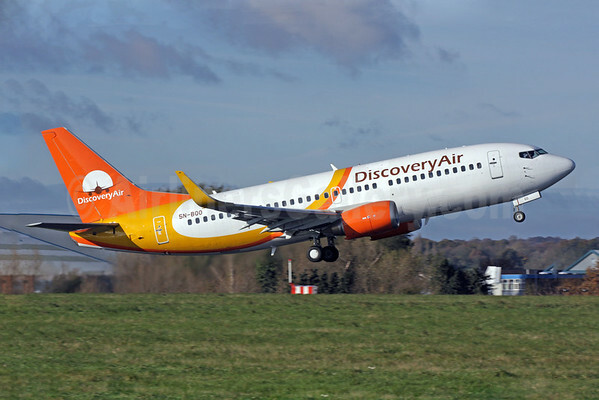 This entry was posted in Discovery Air (Nigeria) and tagged 28571, 5N-BQO, 737, 737-300, 737-36N, Abuja, air operator certificate, Boeing, Boeing 737, Boeing 737-300, Discovery Air, Discovery Air (Nigeria), Lagos, passenger operations, Port harcourt, SEN, Southend on June 6, 2014 by Bruce Drum. Azman Air (Kano, Nigeria) was finally awarded its Air Operators Certificate (AOC) from the Nigerian Civil Aviation Authority (NCAA) and commenced scheduled passenger operations on May 15 with two former bmibaby Boeing 737-300s (5N-HAI and 5N-YSM). The first routes are Kano-Lagos, Lagos-Abuja and Kano-Abuja. Copyright Photo: Keith Burton/AirlinersGallery.com. Boeing 737-36N G-TOYF (msn 28557) became 5N-YSM on delivery. 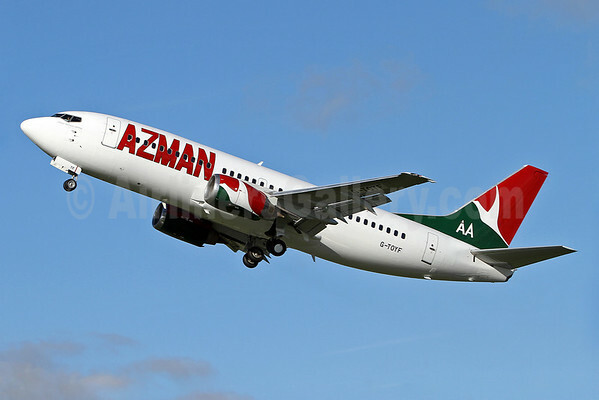 This entry was posted in Azman Air and tagged 5N-YSM, 737, 737-300, 737-36N, Abuja, Air Operators Certificate, Azman Air, Boeing, Boeing 737, Boeing 737-300, G-TOYF, Kano, Lagos, Nigeria, nigerian civil aviation authority on May 17, 2014 by Bruce Drum. Emirates (Dubai) has announced a new daily service to Abuja and Kano from August 1, 2014. The announcement follows Emirates’ recent milestone of 10 years of successful operations to Lagos, to which the airline flies twice daily. Abuja, located in the center of the country, is a planned city built largely during the 1980s which replaced Lagos as Nigeria’s capital in 1991. It is the seat of the Federal Government and home to most of Nigeria’s institutions, including the Central Bank of Nigeria and Nigerian National Petroleum Corporation. Abuja is also the headquarters of the Economic Community of West African States and the regional headquarters of the Organisation of the Petroleum Exporting Countries. Kano, the capital of Kano State in northern Nigeria, is the second most populous city in Nigeria after Lagos, and has a history that goes back hundreds of years. The area is known for the production and export of groundnuts, which was a major source of Nigeria’s export earnings before the oil boom in the 1970s. Emirates SkyCargo, the freight division of the airline, introduced a scheduled freighter service to Kano in October 2013, and with Abuja joining the network, Emirates will now fly to 26 destinations in Africa and 142 worldwide in 80 countries. 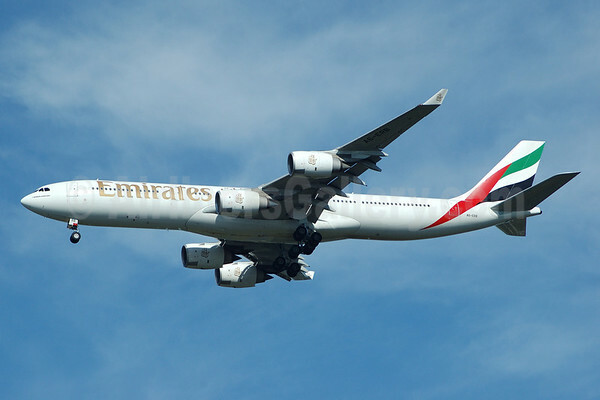 Emirates launched services to Nigeria on January 2, 2004 with four flights per week from Dubai to Lagos linked with Accra in Ghana, using an A330-200 aircraft. Just over a year later Emirates increased its services from four to six flights a week, and following further demand, it became a daily operation in October 2005. On January 1, 2006, Lagos was delinked from Accra and became a direct service to Dubai. On February 1, 2009, a second daily service was introduced, and today each flight is served with a Boeing 777-300 ER. The route will be serviced by an Airbus A340-500 offering a total of 258 seats in a three class configuration – 12 in First Class, 42 in Business Class and 204 in Economy Class. Abuja will be the first stop on the linked service on a Monday, Wednesday, Friday and Sunday, and Kano will be the first stop on a Tuesday, Thursday and Saturday. Emirates flight EK 785 will depart Dubai at 1030 and arrive in Abuja at 1450. The flight will depart Abuja at 1640 and arrive in Kano at 1750. The return flight will depart Kano at 2025 and arrive in Dubai at 0615 the next morning. Flight EK 786 will depart Dubai at 1030 and arrive in Kano at 1430. The flight will depart Kano at 1625 and arrive in Abuja at 1735. It will depart for Dubai at 2005 arriving at 0615 the next morning. Copyright Photo: Bruce Drum/AirlinersGallery.com. Airbus A340-541 A6-ERB (msn 471) arrives at New York (JFK). This entry was posted in Emirates Airline and tagged 471, A340, A340-500, A340-541, A6-ERB, Abuja, Airbus, Airbus A340, Airbus A340-500, Emirates, Emirates Airline, JFK, Kano, New York on February 5, 2014 by Bruce Drum.